Is Tony Abbott as much of a political liability as Labor hopes? Could he duplicate Andrew Peacock’s relative success as Liberal leader in 1984? Abbott served as Health minister from late 2003 to the defeat of the Howard government. 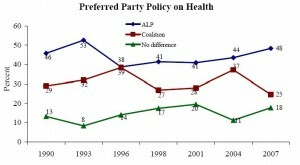 At the 2004 election one factor contributing to the easy re-election of the Howard government was that Labor’s traditional advantage on health policy had been largely eroded (graph from the Australian Election Surveys (pdf)) . Perhaps Abbott could take some credit for this but more probably goes to the proceeding Liberal health Ministers Kay Patterson and Michael Wooldrige and by the 2007 election Labor rebuilt its traditional advantage on health to the highest level on record. This suggests Abbott does not do a good job of arguing a difficult case. More broadly the Liberals’ position now resembles that of 1984. That year Andrew Peacock as Liberal leader skilfully capitalized on minor voter grievances to generate a swing against the apparently invincible Bob Hawke whose Labor government had enjoyed huge poll leads comparable to those of Kevin Rudd currently. In retrospect Peacock’s 1984 performance was a false dawn it led to the Liberals being scrutinised seriously as an alternative government and the opportunism that worked in 1984 was soon found wanting (as was recognised by John Howard). Today the Liberals aspire to this opportunism: Peter Costello thinks climate change is a problem but doesn’t want to do anything about it, Peacock thought the budget deficit was too big but opposed welfare means-testing and wanted lower taxes. Only the US Republicans seem to be able to make policy incoherence a winning formula. Joe Hockey was the Liberal’s best prospect for a rerun of 1984 but Tony Abbott will demand that people vote for the Liberals rather than against Labor.